So Shay: Did he really just say that? Today was my annual lady Dr. visit and I know what you are probably thinking...WHY are you sharing this? Well, you see...I wasn't going to because honestly, who really wants to know that? Who really cares, right? We were talking about what I've been up to lately (jobs, life in general) and really, I was just ready to get this whole thing over with. Dr.: "Wait a minute...Did you just get your hair done?" Me: "Umm, yeah? Kinda. I guess it was about two weeks ago." Dr.: "But is it a different color blonde?" Me: "Ummm, I guess? I don't know...I told her whitish blonde highlights..."
Dr.: "Yeah! It's a different blonde." Me: "Okay...Is that a bad thing?" Dr.: "Well, yeah! I liked it the old color. This color makes you look older. (Points to my face) Your face is young, but your hair color is whitish and it makes you look older." I mean, what was I supposed to say? Let me rewind a bit. When he first came into the room just to chat, he and I were talking about something non-appointment related and my weight came up. I hate when it is time to step on the scale. My eyes pretty much popped out of my head when she told me the number. Shall I dare tell y'all? Shoot...Okay, I will tell. I've gained 12 pounds since last year!!! Seriously Google!? 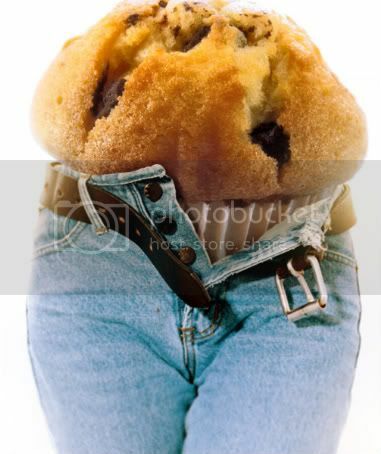 I just googled "Muffin Top" and this was one of the first results. That's just mean. Yes, I did eat a cupcake and Chick-fil-A today...and I did just drink two really tall glasses of water...but OMG. It was not something I wanted to see or hear. Talk about a button popper on yo pants dude. Much better Google. Thank you. I said something about gaining weight, and being tired and he said, "Do you work out?" Me: Well, I do, but I haven't lately. I really haven't had the time or energy...I know that isn't an excuse, but it is true. I need to start back up. Dr.: "There is always time..."
Me: "I know, but I'm tired, and I haven't had the energy in awhile. I will start again soon." Dr.: "What time do you have to be at work?" Dr.: "See, there! You have time! Just get up early and get your work out in." Me: "Yeah, I want to do that. I just don't go to bed until late most nights because I'm working on pictures, or something...I am not a morning person. I will find a way somehow though. It's just been a couple of rough weeks. I really like my Dr. but...somehow he found a way to tell me my hair made me look older, and that I clearly had gained weight and needed to work out. I honestly don't think his intention was to hurt my feelings. I really don't. ShareDid he really just say that? would it be ok if this gave me a little laugh? You are hilarious. I actually can't BELIEVE he said that about your hair. Maybe he was trying to flirt with you? HA! and don't feel bad. Today someone asked if I was expecting another baby. I'm totally not. WHO ASKS THOSE KINDS OF THINGS????? Sometimes I think men just aren't very sensitive to these things... as many ladies said earlier today, you are stinkin cute! Don't let that silly doctor get you feeling down! You totally have the right to be upset, but don't be! You are gorgeous! I agree with Caitlin. I think some people just aren't sensitive to things like that and don't really think about it before they say it. The MALE doctor doesn't know what he's talking about. :) I like the hair! guys never say the right thing about our weight... it's like a proven fact. I've recently had one guy tell me I looked good because I was"thicker. not as skinny as before." and I do believe he straight up said Id "gained some weight." Then... my ex's dad said "a lot of good looking women work out there so you wouldn't stand out at all." which didn't bother me that much but he apologized and my one friend was like "what the what?!" If you have a y chromosome stay out of this discussion! right? Ohhh Goodness. I think he had the best of intentions.. and it's great that he actually pays attention to changes (not only in your health). But I'd say leave the opinion at the door! I like your hair, and I think you look beautiful! I'm pretty sure everyone else would agree! And SO WHAT if you've gained some weight. Our bodies are constantly changing and as long as you are comfortable and feel beautiful, that is the only thing that matters. I would definitely be a little bit sad! Now that is just not nice and I would have been upset too - but I'm sure he didn't mean to hurt you. Sometimes guys are just completely clueless. And you look super cute anyway ! Oh man, guys always want to say the right things, but they NEVER come out that way. I am sure he was trying to be your friend and doctor. Like "The cool doctor" haha. And so what if yo've gained some weight! It's hard being a girl sometimes. Our weight is constantly changing (well, most "real" women). I am sure you will be down in no time. You are beautiful!! And that WOULD be the first picture of muffin top. Cruel cruel cruel. This guy proves what they've all been saying- even a guy who is a professional of hoohas doesn't even know how to say what he wants in the way women need to hear it. you are gorgeous, dont let it get you down!! Oh my gosh! How annoying, but totally funny (now, not then). I'm sure he was trying to be nice (somehow) but some people just need lessons on small talk! I love your hair and your muffin top! Ok, now I'm creepy. ps. you don't have a muffin top!!! it would be one thing if you were borderline unhealthy but if you gained a little weight here and there -- well, hun, that is YOUR business and he has no idea if there is stuff going on in your life that is stressing you out. I wouldn't think too much on it -- men tend to be a little oblivious to things...especially when talking to females. Shalyn don't fret!!! I feel exactly as you do when I have to go not only to the regular doctor but to the gyno as well. I DREAD the dreaded scale step!!!! For the last few years, I have consistently gained 2 pounds. I know it's not twelve, but I think weight gain does come with age. not that you are old by any means I mean I'm 28 soon to be 29, but I have just also come to terms that my 21 yr old body is long gone lol. You have to remember, it is his job to remind ya to be healthy IE the gentle reminder about asking about working out. You wouldn't want your next visit to hear bad news like your cholestrol levels are to high right? I just had my yearly, and the doc told me that I was borderline cholestrol levels were high. WTF?! I'm 28 and eat healthy how does that happen? I was much like you, don't have time to work out consistently. I just go when I can, and tell myself not to feel bad.I mean if I really truly am going when I can, then I have nothing to feel bad about right? You shouldn't either. Awww, what a way to start your day. No one wants to hear that and if you were obese then maybe he should have said something but you in NO way look like you need to be worried about that. Life is too short to not indulge a little bit. Hope your Friday is amazing regardless. That's no fun! Don't take it to heart...he's a man after all and probably didn't think twice that saying those things might hurt your feelings. I love your hair and we all go through spurts of weight gain...especially with marriage and stress! I think you always look so darn cute! Hey, I was wondering if you would do a guest post for me next week while my husband and I move? Let me know!! p.s don't feel bad about what your doctor said... he probably thinks his opinion is worth gold like most men/doctors. GAG. I too HATE scale time at the doctor's office. Ugh. Even though I lost this last year, I'm still above where I need to be. I'm sorry :( That's annoying! I was out of blog land when you posted this, so here I am 3 weeks later. I have to admit, I clicked b/c I saw that kind of scary girl with a 6-pack picture...sure it was a girl? Hmmm. Notsomuch. Wow. Kinda sounds a little creepy...but that's just me, reading this from thousands of miles away...looking from the outside in. Too personal, even if he is your doc. BTW...not like I knew you 12 pounds ago, but you look perfectly fine to me!